Melissa Casserly from EZ Living Terryland presents Noirin Ui Ghoill with her prize. The EZ Living Furniture biggest sale ever has just been extended, with the fourth Golden Ticket competition winner being chosen in the Terryland, Galway, store. 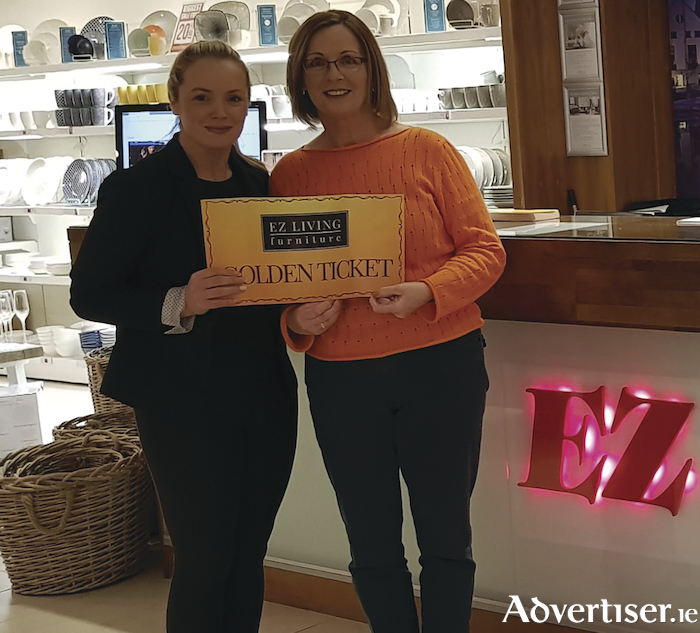 Noirin Ui Ghoill from Inis Mor, Aran Islands, was awarded a €2,000 prize as part of the EZ Living Golden Ticket Competition, in conjunction with the last week of the Biggest Sale Ever. For the month of January EZ Living Furniture ran a competition to win your furniture for free, with more than €8,000 in prizes being given away every week. All customers had to do was simply make a purchase during the Biggest Sale Ever in-store or online to be in with a chance of winning their furniture or accessories for free in the weekly draws. As well as receiving €50 vouchers, the winners from each store were entered into a draw to win a grand prize from €500 to €2,500 in EZ Living Furniture vouchers every week. The EZ Living Furniture Biggest Sale Ever has been extended to this Sunday, with final reductions on everything reduced including sofas, dining, bedroom, mattresses, and home accessories. There are also now further reductions across all departments including sofas from €249, dining tables from €399, and beds from €179, and 30 per cent off almost everything in the home accessories department, so this is a sale not to be missed. Visit www.ezlivingfurniture.ie/goldenticket for more information and to see the terms and conditions for the competition.